OK, this one’s for all you lovers of unabashedly, un-apologetically New-World-style wines. The wine that sent me over the edge last night was Martin Family Dry Creek Cabernet Sauvignon 2009. It comes from a small-production, family-owned winery that, “is basically a passionate hobby that’s gotten a bit out of hand…. sort of like starting out collecting baseball cards and then one day realizing you own a major league ball team,” according to Jim Morris, vineyard manager. Mike Martin, owner and winemaker, got the ball rolling by making wines for family and friends. They were a thirsty lot, and “because they wanted more free wine,” he made more. Then he planted a vineyard and contracted with some of the best growers in the Dry Creek Valley. He now produces about 4,000 cases of big reds (Cab, Zinfandel and Syrah) from vineyards in this northern Sonoma County appellation. The lazy waterway called Dry Creek is a tributary of the Russian River, which all you Pinot Noir freaks know is the epicenter of a cool-climate region that produces some of America’s best Pinot and Chardonnay. The Dry Creek Valley AVA lies just north of the Russian River Valley, but has a very different micro-climate. Because its topography lies above the fog line, Dry Creek grapes begin each day in sunshine and cool-ish temperatures that warm considerably through the afternoon. A return to cool temps at night builds the structure that keeps Dry Creek fruit from becoming jammy. Now I get it: that’s why the ripe, round aromas of blackberries jumped right out of the bottle, followed by rich mocha when it hit my glass. The color was deep garnet and almost opaque, showing good extraction and concentration. The palate didn’t waste any time revealing gobs of rich blackberry and dark cherry fruit, along with some vanilla oak and chocolate. But just when all this opulence threatened to become jammy, the acid kicked in, brightening and cleansing the flavors. And right behind that were the well-integrated tannins that added depth and dimension. This is what balance is all about, right? We can have our big up-front fruit and 14.8% ABV (that’s what the bottle says!) as long as we cool it down with proper acid and tannic structure. Did I mention that all this goes for under $20? Yes, you can share the love for what I consider to be a bargain-basement price for wine of this quality. My next mission is to find the Martin Family Syrah — I can’t wait to see what they do with that grape… Cheers! What?? What’s this new name from a winemaker we’ve been following for years? If you’re a Pinot Noir lover, and you haven’t been living under a rock for the last 10 years, you’ve seen Gary Farrell’s name on some of the top-rated and best-selling Pinot’s coming out of Sonoma County’s Russian River Valley. The winery he used to own, perched high on a wooded hillside overlooking the river, produced some absolutely classic Pinot Noir that helped define the style for this Northern California appellation. And I was I glad I did. I haven’t enjoyed such classic Pinot in a long time. In the Russian River Selection, he uses fruit from five great Russian River vineyards, including the Richioli and Allen vineyards. And the style is as classic as the vineyards. The nose set the tone with delicate aromas of black cherry pie filling and baked caramel. Now I know that sounds pretty rich, but you have to understand the style — you get all these rich “goodies” wrapped up in a restrained, balanced package. The palate revealed more. My first sip gave me a burst of bright black cherry fruit, and the acid kicked in right behind it. There was no “tooty-fruity, jammy” character — the stellar balance kept all the elements working in harmony. More flavors jumped up and waved hello as the wine sat in my glass. I got some baking spice, some vanilla, some mocha — but all controlled by that nice, laser-beam acid balance. To me, this is as good as wine gets: intensity without weight. It’s great to drink a bottle of wine that doesn’t exhaust your palate with too much fruit and alcohol. Now don’t get me wrong — I’m as much of a hedonist as the next guy, and can enjoy a glass or two of a big fruit bomb. But only a glass or two. Gary Farrell’s Pinot could be savored all night long. Which is what I did. At least until the bottle gave out. Find this bottle, if you can, and enjoy it for yourself. Cheers! American wine drinkers (at least those who live east of the California state line) have never heard of the region. Which is really ironic, because the Temecula Valley lies just a stone’s throw from where the whole California wine thing got started — sometime around 1820. Wine grapes were first brought to California by Spanish missionaries, who built a string of missions along the California coast to bring Christianity to the heathens. Remember that thing about the swallows coming back to San Juan Capistrano? Well, San Juan Capistrano was the first mission, and it was built a mere 18 miles west of present day Temecula. The good monks grew Mission grapes and made sweet, fortified wine for communion (or whatever…). Temecula sits on a plateau at about 1,400 feet elevation, snugged up to a higher mountain range. Mists linger until mid-morning, helping to cool the region. Cold air also gets sucked in from the Pacific Ocean through gaps in the coastal mountains, creating ideal micro-climates for high-quality wine grapes. Is this ringing a bell? Does this sound like the conditions that make Napa, Sonoma, and Santa Barbara such great regions for wine grapes? On top of the above, the surrounding mountains create “rivers” of cold air that drift down over Temecula, creating a double cooling effect. But wait — that’s not all! Because the area is further south than, say, San Francisco, the vineyards are closer to the Equator and receive more radiant heat. So OK, we have that wonderful “warm days, cold nights” thing happening, plus relatively little rainfall during the growing and harvest season. Soils, too, are well drained, producing clean, pure varietal flavors. So this looks like a recipe for great wine. It makes me wonder why all of us non-Temeculties took so long to discover this little wine region. My excuse is that I hadn’t tasted any of their wines — at least until a few nights ago, when a friend brought over a bottle from Wiens Family Cellars. Not being one to turn down free alcohol, we popped the cork and… enjoyed! We were drinking Wiens 2008 Tempranillo-Petite Sirah. That’s an unusual (or even unheard-of) blend. Who ever thought to combine this Spanish grape with California’s big, bold, dense, brooding varietal? But I gotta tell you — someone should have thought of it sooner. My first sip was enough to make me say, “Of course!” It’s a great idea to use the bright fruit and crisp acidity of Tempranillo to tame the often-too-heavy Petite Sirah. When I poured the Wiens, the color looked very “Petite.” It was opaque and red/pourple, and I geared myself for a big, big wine. The nose, however, showed some bright cherry up front, followed by some heavier caramel and dark berry notes. The palate was a happy marriage of both grapes. I loved how the acid from the Tempranillo cut the heaviness of the Petite Sirah, and made this a pretty decent food wine. I got more complexity, too, as it sat and breathed, with nice brambly notes, mocha and vanilla creeping in. Wiens Tempranillo-Petite Sirah is a well-made wine, and it’s fun to drink. It’s kinda pricey at $50 a bottle — I assume that’s one of the unfortunate repercussions of operating a small-production facility in a place like Temecula. But I wish the folks at Wiens the best — they’re doing a good job and helping to put the Temecula Valley on the wine map. I’ll tip my hat to the ghosts of San Juan Capistrano, and say, Cheers! When I think of California’s Gold Rush Country, up there in the foothills of the Sierra Nevada Mountains, I think of crusty old miners swilling cheap liquor from a jug. I believe they were a hard-drinking lot; not the kind to be enjoying elegant Italian varietals. So I was knocked out recently when I came across two killer Cal-Itals from Amador County. For those unfamiliar with the term, “Cal-Ital” refers to Italian varietals (Sangiovese, Barbera, or Arneis, for example) planted in California soil. It’s like an “Old World meets New World” kind of thing. Cal-Itals can be hard to find if you don’t live in California, so those of us in the hinterland are thrilled to discover good ones. Let’s look at the Barbera first. This grape is best known as Barbera d’Alba, produced in the Piedmont region of Northwest Italy. There, it makes a medium-bodied red with low tannins, high acidity and cherry/blackberry flavors. Italian immigrants (maybe some of those gold miners?) brought Barbera to northern California, and the grape thrived in the warm, dry climate. They were so happy that the grapes did a little Tarantella! So speaking of OMG moments, let’s go to Paul Sobon’s Amador County Sangiovese. This is the grape that made Chianti famous, and you may know that Chianti is a region in Tuscany, Italy. Chianti’s reds can range from bright and fruity to bold and full-bodied, but they always have good acidity. I opened Paul’s wine with a plate of Chicken Parmesan, and I had my own OMG moment. This Cal-Ital is more fun and fruity than the Barbera, with a bunch of soft cherry/berry fruit, spice notes and mocha adding complexity. There was a surprising richness and velvety mouth-feel — but then again, I was enjoying this with the kind of food that could tame the classic acidity. The tasting notes revealed that the winemaker added a dollop of Zinfandel and a pinch of Petite Sirah, which added more “Cal” to the Cal-Ital. All Sobon wines are produced from sustainably farmed grapes, and the winery uses solar generated power, composting, natural pest control and other sustainable practices. That’s good — I like to be able to recommend a wine that’s environmentally friendly, as well as darn good. Cheers! When you’re talking classic, blue-chip Napa wineries, you’d better be talking about Pine Ridge Winery. Sitting just off the Silverado Trail in the Stags Leap District, Pine Ridge has been making wine since 1978, long before the Napa Valley was choked with wine tourists and Highway 29 became a parking lot. Gary Andrus’ first vineyard was planted on a ridge above the winery, and it’s been joined by four others representing the best and brightest appellations in the valley — Rutherford, Oakville, Howell Mountain and Carneros. I remember visiting Pine Ridge Winery several years ago. I remember the warm Napa Valley sun, and then the cool calm of the Pine Ridge wine caves. And I remember the wines — sort of. I know I loved the Chardonnay and a handful of Cabernets. But the details are foggy, lost in a touring-and-tasting haze. I tasted them again recently in a manner much more conducive to memory retention. I tasted them through a Twitter TasteLive event where I watched a streaming video of the winemakers discussing the wines, while I tasted them in the privacy of my own home. It was a great use of online technology. Winemaker Michael Beaulac and Assistant Winemaker Jason Ledbetter tasted whites first, so I’ll talk about them today. The first white is a blend that I’d expect to be a hell of a hard sell to most American wine drinkers. Chenin Blanc and Viognier don’t really rock the U.S. wine world, but somehow Pine Ridge has made their Chenin Blanc/Viognier 2010 into a big seller. I’d wager that 90% of the folks who like this wine don’t know anything about these native French grapes, but they don’t need to. Anyone can enjoy this wine if; a) you don’t like oak; and b) you don’t like dry. That doesn’t mean this wine is sweet, but it has a rich, soft approach that makes it friendly to almost any wine drinker. The Chenin Blanc (79%) is sourced from vineyards in Clarksburg, which is northeast of Napa in the Sacramento River Delta area. The relatively cool climate there allows the grapes to retain great natural acidity, which balances the fruitiness of the grape. The Viognier (21%) in the blend, sourced from warm-climate Lodi, adds richness and lushness. For me, I got a nose that led with honeysuckle and slid into tangerine and floral notes. The palate was rich and viscous, with apricots and honey morphing into a tangy, spicy finish. There is a trace of residual sugar, which is what helps this wine appeal to a really broad market. At under $15, this is a very good value, and a step up for those who’ve been buying White Zin just to get some sweetness in their glass. The Pine Ridge Carneros Dijon Clones 2009 is a more “serious” white wine. It’s made with fruit from Pine Ridge’s Carneros vineyards, which Michael and Jason explain are covered in cool fog for a good part of the day. Cool temps allows the grapes to mature slowly, creating intense fruit flavors with good acid to balance them. Pine Ridge is certainly not a typical California Chardonnay. Instead of all that heavy oak and butter, this Chard offers crisp fruit and a clean finish. On the nose, I got more spice than fruit: there was wood spice and Meyer lemon, and maybe a hint of banana. The palate was more obvious. I got baked apple, custard, and baking spice, all wrapped up in a viscous mouthfeel that comes from aging “on the lees.” Again, just like the Chenin blend, there was crisp acid on the finish that balanced the rich flavors. Pine Ridge seems to be hitting the modern American palate right on the button. They’re making very sound, very delicious wines that can appeal to lots of wine drinkers. I wish them all the best. Lots of wine drinkers know Benziger Winery. This family-owned operation that sits on the slopes of Sonoma Mountain has been known as a leader in organic and bio-dynamic winemaking. Their Chard and big reds are the wines we see out there in the market, so I was surprised to receive a set of four Pinot Noirs. From Sonoma Mountain? Of course not. Pinot needs a cool climate in order to thrive, like the climate in — hey, the appellations on these single-vineyard Pinots are Russian River and Sonoma Coast! That’s two of California’s best AVA’s for great Pinot Noir. We tasted them recently, while listening (through Twitter TasteLive) to winemaker Rodrigo Soto. He took us through the tasting in a way that really showcased their unique character — their terroir. We tasted from furthest inland, almost at the eastern edge of the Russian River AVA, to just five miles from the Pacific coast. Our first wine was Signaterra San Remo Vineyard Russian River Valley Pinot Noir 2009. Not only was this my favorite of the tasting, but it had a unique quality that made this Pinot irresistible. The nose showed tart fruit aromas — rhubarb, cranberry — with a little floral note. The palate started off with red berries, but I was immediately distracted by the quality of the mouthfeel. This wine just glided over my palate. As the berry flavors turned more complex, with some smoke and “meat” coming through, the whole thing was gently seducing me. Now I know Pinot is supposed to be “velvety,” but this one set a new standard. Winemaker Rodrigo Soto credited 25% whole-cluster fermentation with creating “a different tannic structure.” With this method, an entire bunch of grapes goes into the fermenter instead of (crushed) skins and juice. He said it affects the flavors and the finish, creating the elegant mouthfeel I enjoyed so much. Moving further west in the Russian River, we tasted Signaterra Bella Luna Vineyard Pinot Noir 2009. Yields are kept low in this bio-dynamic vineyard and whole cluster fermentation is used again. But the nature of this wine was very different. A cooler climate produces a more austere, earthy Pinot, and one that took longer to open. In fact, when I revisited it the second day I tasted the deep berry and smoke that I’d missed first time around. The Sonoma Coast Pinots, grown just a few miles from the cold Pacific, were bigger, brawnier, and needed time to show their stuff. De Coelo Quintus Vineyard Sonoma Coast Pinot Noir 2009 leads with a nose of black cherries and licorice, and a good deal of natural acid keeps the fruit clean and bright. Rodrigo explained that he tries to maintain the distinctive nature of each vineyard’s fruit by using native yeasts in his fermentation. That means the winemaker can’t alter the flavors through the use of selective yeast strains, and it’s a practice he applies to all his wines. De Coelo Terra Neuma Vineyard Sonoma Coast Pinot 2009 is leaner, more peppery and meaty. I got the chalky minerality that Soto looks for in order to “lift up the wines and give them personality.” Acid levels promise good cellarability for both these wines, and Rodrigo guess-timates that coastal Pinots with the acid and tannin structure of these two can easily go seven to nine years. It was a rare opportunity (and a real blast) to see how vineyard locations just a few miles apart can produce such different wines. Of course, having the winemaker handy to explain his approach sure adds to the experience. Maybe you can stop on down to Benziger and get a first-hand taste yourself. Cheers! I love Chardonnay, but I’m really fussy about it. I’ve tasted way too much over-oaked, fake-oaked, or way-too-buttery Chard. There are too many out there that are way off balance in one direction or another, and I’m done with suffering through them. Olema has a great back-story. It’s actually the second label from a winemaker who’s a veritable Napa Valley icon. Ever heard of Georges de Latour Private Reserve? Or BV Cellars? Of course you have, and you know that BV’s Private Reserve is one of Napa’s classic Cabernets, created for more than 25 years by winemaker Joel Aiken. He left BV to pursue his own wine interests, and ended up hooking up with some good friends to form Amici (Italian for “friends”) Cellars. I pulled an Amici cork out of my Olema, because it’s is the second label from Aiken’s winery. But this Chard is anything but second-rate. Let me give you my 1-2-3 on that. 1 – The nose on my Olema Chardonnay was positively beguiling, with luscious butterscotch mingling with bright tangerine, and some creamy tapioca creeping in as it warmed in my glass. I could have sat with my nose in the glass all night, but that would have made me really unpopular with my dinner companion. 2 – My mouth tasted rich tropical fruit, with more butterscotch (or was it creme brulee?) rounding out the back. 3 – The finish, which I’d been afraid would have that California “butterball” thing going on, was tangy and bright, lifted up by good natural acidity. Wow! I should have expected this quality from Joel Aiken — I just didn’t expect to find it in a wine under $20. My research showed that there are a few reasons why this Chard hits my sweet spot. First, only 58% of the juice underwent malolactic fermentation. That may be an unfamiliar term, but Chardonnay lovers should get up close and personal with this key determinant of a Chardonnay’s style. This secondary fermentation takes the grape’s natural malic acid, which is like the acid in green apples, and turns it into lactic acid, or the acid in milk. Chard’s that undergo 100% ML have that buttery (some would say “flabby”) finish. Aiken uses just enough ML to round out the mouthfeel. His oak treatment is equally restrained. Only 50% of the wine goes into French oak barrels, with the balance aged in stainless steel. That’s why Olema Chard reminds me of vanilla creme brullee instead of a 2 x 4. Of course, Aiken had some great raw material to work with. Grapes were sourced from Carneros and Russian River vineyards — arguably the best sources for California Chardonnay. And 2009 was an awesome vintage, with mild temperatures and a long Indian Summer allowing the grapes to ripen slowly and develop lots of flavor and complexity. So here’s my summary — just go buy this. Then pour it for someone who thinks they have to spend $40 to get a top-quality Chardonnay. Cheers! I’m guessing that’s what Bruce Cakebread thought when he called in the cavalry (so to speak) to rescue his grape crop. 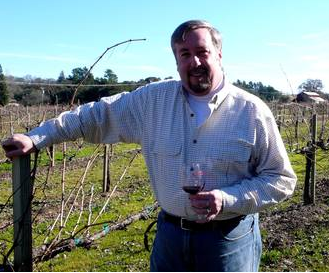 Bruce is the president of Cakebread Cellars, one of Napa Valley’s Blue Chip wineries. His vineyards, along with every other vineyard in Northern California, were deluged with rain during the 2011 harvest. Take my word for it: rain during harvest is a VERY BAD THING. Moisture sitting on the grapes and caught in the bunches can allow rot to develop, and that can potentially RUIN THE ENTIRE YEAR’S CROP. So Bruce got very creative. He borrowed a trick from old-time cherry growers and hired a helicopter to come charging over the hill and save the day. 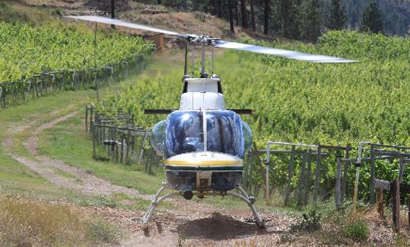 The chopper flew back and forth across the Cakebread vineyards, just 20 feet above the valley floor, and stirred up enough wind to (hopefully) blow the moisture off the grapes. Wow — that’s creative thinking. I picked this story up from Dr. Vino’s very fun wine blob, and he picked it up from NPR (National Public Radio), my sole source of information about the world. Check out the full story on NPR to get all the details. It’s a great tale of creativity and ingenuity, but it also helps us to remember that at its heart, winemaking is agriculture, and winemakers are essentially farmers. They live by the land and are at the mercy of Mother Nature, working tirelessly to stay ahead of whatever she might throw at them. Those of us who drink wine need to send an occasional shout-out to those who make wine, and thank them for devoting their lives to our pleasure.